People stop noticing that they have lost their faith. Cynics have entered the Church: they live in it, have gotten used to it, and do not especially want to leave it, since everything has become so familiar. And how does this look from the outside? Cynicism is very often the sickness of professional Orthodoxy. 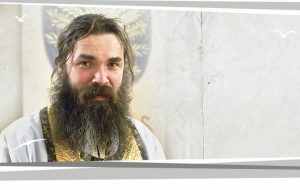 Sretensky Monastery rises early: the interview with Fr. Tikhon is scheduled for 8:30 (!). 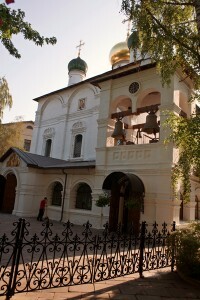 By then, part of the day at Sretensky has already gone by: the brotherhood’s moleben [supplicatory service] has been served and the seminarians have finished breakfast and are working at their obediences before classes begin – some, for instance, are sweeping the courtyard in front of the church. 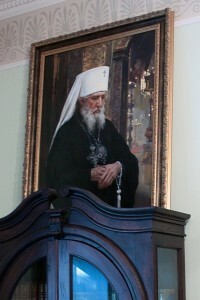 Have a look: isn’t that indeed a good portrait of Metropolitan Laurus, very accurately conveying his facial expression? Yes, that is Metropolitan Laurus, who came to Russia many times from far-away America under the guise of a simple monk, travelling around monasteries, breathing in faith. Where has our faith gone? This will be the subject of our conversation today with Fr. Tikhon. Fr. 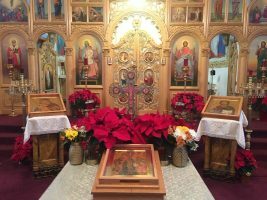 Tikhon, where has our faith gone? How has our need for divine services, prayer, and joy been lost? Once I spoke with Archimandrite Seraphim (Rosenberg). This was not long before his death. He was from a family of German barons; after graduating from Tartu University in the thirties of last century he entered the Pskov-Caves Monastery, where he spent sixty years. During that conversation, Fr. Seraphim spoke about monasticism. 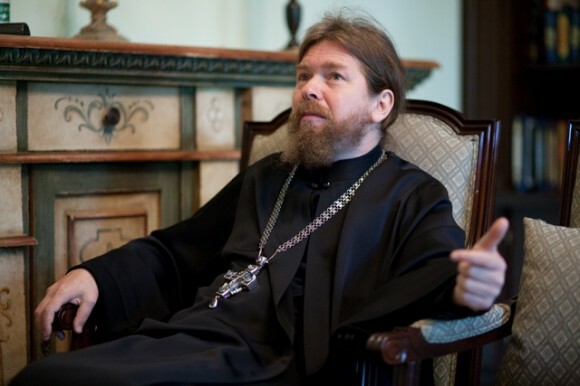 He said that the biggest problem of contemporary monasticism is the lack of resolve. One could probably say the same not just about monks, but also about many of our Christian contemporaries. Resolve, courage, and the spiritual nobility that goes along with them, are very much lacking. But if people would understand throughout their entire lives that the most important thing – regardless of obstacles and temptations – is to go to God, to be faithful to Him, then they would not waver in faith to the point of losing it. The crisis of faith of which you speak is especially apparent in our adolescents. Children at the age of eight or nine go to church and sing on the kliros [choir stand], amazing and delighting everyone around them. But by the age of fourteen to sixteen, many – if not the majority – stop going to church. Children have not become acquainted with God. No, they of course are acquainted with the rites, with Church Slavonic, with order in church, with the lives of saints, and with sacred history as arranged for children. But they are not acquainted with God Himself. No encounter has taken place. The result is that parents, Sunday schools and – sad as it is – priests have built the house of childhood faith upon the sand (Matthew 7:26), and not upon the rock of Christ. How can it happen that children do not notice God, despite all the most sincere efforts of adults to instill faith in them? How can it turn out that children still does not find within themselves the strength to discern Christ the Savior in their childhood lives and in the Gospel? When responding to this question, we raise yet another adult problem, one that is reflected in our children as in a mirror. This is when both parents and priests teach one thing, but live in another way. This is a most frightful blow to the tender strength of childhood faith, an unbearable drama for their sensitive minds. Of course not! Glory to God, we also have plenty of shining examples. In our Sretensky Seminary I see remarkably pure and sincere lads – although, of course, all kinds of temptations happen. Life is life. But these are adolescents. What about people who come to church as adults? What’s the difference? Something similar happens with adults. We also offend one another (in this case the “little ones” about which the Savior speaks are not necessarily children in terms of age) by our tepidity, our conscious violations of the Gospel commandments, and our impure lives. People gradually develop the impression that a Christian can live however he chooses. When this happens, people who came to faith in adulthood gradually loose interest in the spiritual life – they get tired of it all. There is no real communion with God, which means that there is no life of the spirit. During the first three years or so of faith, Orthodoxy is interesting; one’s new life is captivating and accompanied by a mass of new impressions. But then it all becomes routine. This is probably like family life. As we go on, we have to work hard and endure – enduring oneself, first and foremost. This really is difficult. People who have come to faith at, say, the age of twenty-five, still have another fifty years of such hard work ahead of them. This is the way it has always been – there is no reason to be surprised. Such dryness is, as a rule, an unavoidable step in the spiritual life. St. Theophan the Recluse, for instance, writes much that is interesting about this. This stretch of the road is a desert that one must get through. Unfortunately, not all of our brothers and sisters make it through this road. And there are even some who are permanently, and with much pleasure, entrenched in these barren sands. Digging them out can be terribly difficult. What causes this dryness to set in? Someone does everything that he is supposed to do – he goes to Confession, listing things that he knows are called sins; he reads his prayer rule; he approaches the Chalice – and the more he does this, the more he feels that it is all a matter of formalism, and the actions of “reading through,” “standing through,” “saying Confession” become more mechanical. What should one do? What is the right thing? In Holy Scripture it is said very definitively how to revivify the soul, how to make the soul become young and alive again: seek after God, and your soul shall live [Psalm 68:32]. Seek God, no matter what – stubbornly and persistently! Then the promise of the Lord Jesus Christ will be fulfilled: Seek, and ye shall find [Matthew 7:7; Luke 11:9]. But if there is no search for God, if one’s craving for God and one’s desire to lay hold of Him are lost, then this is cause for very serious alarm. One must employ every possible means to restore this desire to one’s soul. Nothing good can come about without this. Or, in the best case, one will have to wait – as for life-saving rain upon parched earth – for extraordinary trials of the soul, sicknesses, and serious wounds and temptations. But is this possible for a layperson? For the laity? Yes, this is indeed possible for them. As Fr. John (Krestiankin) put it, in our times strong Christians are saved in the world, and weak ones in monasteries. When you are hearing Confessions and communicating with parishioners, you see just what kind of amazing ascetic strugglers there are among the laity; such that we, who call ourselves monks, should learn from. I was astonished at the time, since I had thought that all ascetic strugglers lived only in remote monasteries, somewhere on Solovki or in Egypt. And now, truly, I myself see amazing ascetic strugglers: simple laypeople who teach and save me by humbling me, demonstrating that it is possible to live in a truly ascetic and Christian manner in our times. What does this Christian life consist of? It consists of the fulfillment of Christ’s commandment to love God and neighbor. These are ordinary people: women, young men, young women, grown men. I am not even talking about grandmothers, who fulfill prayer rules that, to be honest, would make a monk feel uneasy. Moreover, they have been fulfilling these rules regularly for decades – and with the complete certainty that they are not doing anything special! She will read a certain number of kathismata for her older son, a certain number for the middle one, and a certain number for the youngest daughter. And then she will say the Jesus Prayer fifteen hundred times, just to feel her sinfulness at least a little tiny bit. And then still some prayers of intercession for others and an akathist – how can one do without that? I am telling you about the actual prayer rule of an actual parishioner. Such ascetic strugglers, male and female, are innumerable! Besides this, in any case, they work: they go shopping, do the ironing, do the laundry, and raise their children and grandchildren. They are not proud or vainglorious; they think nothing to themselves; and they are ready at any moment to serve their neighbor. Simply associating with such people is of extraordinary help in acquiring hope and resolve for those of us whose faith is impoverished. But certainly true Christianity does not consist in the reading of prayers? Of course, it does not consist in the reading of prayers – but rather in prayer as living communion with God! One simply needs to understand that there can be many different forms of prayer. The Holy Fathers felt that the spiritual life is determined by the quality and purity of prayer. But it goes without saying that if someone thinks that he is praying, but at the same time he is angry and misanthropic, then he can only be pitied. But you know, perhaps I am just lucky, but I have not met such people for a long time. There are plenty of examples of young people serving in church, but then not helping their families in any way. Well, it happens that someone might, as they say, “go Kronstadt.”  He begins to delve into the spiritual life and to move towards a worthy goal, all the while trampling on his unfortunate loved ones. This is what a spiritual father is for. There is time; there is a misfortune; finally, there is a fall. But I would not want to put forward such sad cases as the norm today. Rather, I think of this as a childhood sickness. Many people have had chickenpox, but few are pockmarked. 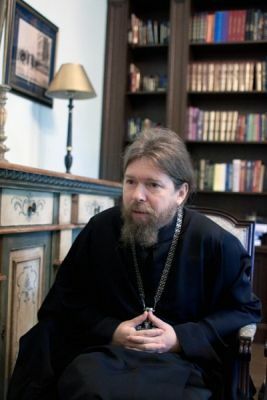 Today, in a certain sense, it has become “good form” in Orthodox circles to say that someone has over-prayed: he reads his prayer rule, canons, and kathismata – he is just too pious. This is given as a diagnosis. But we do not take the role of judges upon ourselves out of an excess of spiritual discernment. More often it comes from our own lack of faith, from our laziness and self-love. It is in the interest of defending our own lazy dawdling that we consciously paint such pictures, like some kind of Ferapont from The Brothers Karamazov – you will recall that in Dostoevsky there is this cruel and foolish ascetic struggler. You know, there really is a great danger in how we eagerly overemphasize and exaggerate such unhealthy cases, thereby using these examples to begin – unnoticeably to our own selves – to defend our own negligence and tepidity. In church settings it has become all too common to circulate malicious and perniciously generalizing stereotypes: if women are church-goers, they are wicked witches; if they are young people, they are neurotic; if they are adults, they are losers; if they serve in the altar, they have abandoned their families to be in church; and if they are monks, they are money-grubbers and profaners. Who would argue with that? One cannot say that such things never happen, that all this is untrue. But why convince oneself and others, with persistence worthy of a better cause, that this situation is characteristic of our Church? 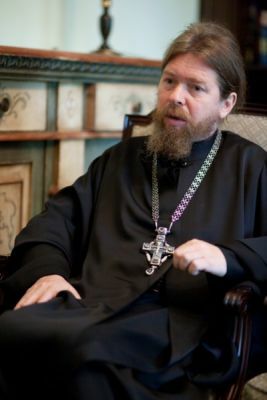 I once took a sort of trip through Orthodox [Internet] forums, and I simply could not believe the cynical malice that Orthodox people – people who consider themselves very learned in church matters – show not only towards the clergy (for whom they have no respect whatsoever), but even towards the most pious laity. These terms, I am afraid, have not come from just anywhere; they have come from within the Orthodox milieu, because only “one’s own” could use such keen taunts. Be that as it may, they have been enthusiastically adopted by our milieu. And this is a truly disturbing phenomenon in our Christian community. Moreover, we are gradually beginning to view both ourselves and those around us through the prism of such pejorative notions. Recall how Tolstoy, in Childhood, Boyhood, Youth, has a remarkable discussion of comme il faut and the ruthless impact it had on his life. Now (fortunately only in the fringes of church circles, because it is simply impossible to consider such people to be of the Church) an Orthodox comme il faut is developing, and anyone who does not conform to it becomes an outcast, a completely contemptible person. So we arrive at cynicism, which in fact has its origins in the very sickness of tepidity that has infected Christians from the time of the Laodicean Church [cf. Revelation 3:15-16]. The enemy power that is gaining force within the Church, among Christians who have grown spiritually cold, is infinitely more dangerous than any outward force or persecution. We teach our students never, under any circumstances, to become “Orthodox comme il faut,” for they themselves do not notice how they lose their faith, how they become careerists, how all the values in their lives change completely. When people of the older generation get together, they often say: “How nice it was in the sixties and seventies! What faith there was then!” We say this not just because we are beginning to get old and grumpy, but because this was indeed the case. In those days there was external opposition to the Church from the side of the government, but we were together and we cherished one another. The term “Ortho-nuts” could then only have come from the enemy camp. Only Yemelyan Yaroslavsky could have spoken about “Orthodox brain disease.”  An Orthodox person would never have used or repeated such terms. But now they are heard in church settings, where people flaunt and take pride in them! Why has such an attitude arisen? What is happening? People came into the Church, but they took only a partial liking to it. Gradually, over the years, they came to recognize a terrible truth in their innermost souls: they have the most profound contempt for Orthodoxy. A terrible sickness of treacherous cynicism is beginning among them, akin to Ham’s misdeed [cf. Genesis 9:20-27]. This will infect the people around them, in one way or another. After all, we are indeed a single organism, the Church, and therefore this sickness must somehow be resisted. When the Orthodox faced such things during the Soviet years, they understood that this came from their enemies and adversaries. Now the lessons of contempt and arrogance are increasingly being taught by people in the Church. And we know what the bitter fruits of such lessons are. It remains only to recall the words of St. Ignatius [Brianchaninov], who said: “Apostasy is permitted by God: do not attempt to stop it with your feeble hand.” But he goes on to writes: “Withdraw and protect yourself from it.” Do not be a cynic. A sober and sharp-witted remark when a foolish or impudent person needs to be put in his place, or when one wants to guard someone from excessive enthusiasm, can be perfectly acceptable. But cynicism and Christianity are incompatible. The basis of cynicism, try as it may to justify itself, can only be one thing: unbelief. Once I happened to pose one and the same question to two ascetic strugglers: Fr. John (Krestiankin) and Fr. Nicholas Gurianov : “What is the main sickness in church life today?” Fr. John immediately replied: “Unbelief!” I was amazed: “How so? But what about for priests?” Fr. John again replied: “For priests, too: unbelief!” Later I visited Fr. Nicholas Gurianov who, quite independently of Fr. John, said the very same thing: unbelief. And unbelief turns into cynicism? What, for instance, is the difference between the Forbidden Art exhibit and the painting “Tea Party at Mytishchi” by Perov? In the Forbidden Art exhibit there was disgusting cynicism, while in Perov there is a rebuke. Hurt and rebuke, for which we can only be grateful. Some ascetics could say some very harsh things, such as St. Leo of Optina. Even today in Moscow we have a wonderful Archpriest who can joke so sharply that you had better watch out. But it would not occur to anyone to say that he is a cynic, because there is no malice in his jokes. Twenty years ago, we would have said of such a person: “Lord, what faith! How nice!” But today the prosperity of the Orthodox faith has become no small challenge to Christians. Recall the words of the Apocalypse: Because thou sayest, I am rich, and increased with goods, and have need of nothing; and knowest not that thou art wretched, and miserable, and poor, and blind, and naked (Revelation 3:17). We are impoverished in faith and, therefore, many people have enough of being Orthodox just by looking at us. They continue out of inertia, out of their first love; they still remember how much they have gained in the Church, and still hope to receive grace. How should we properly orient our spiritual lives? The most joyful thing in the spiritual life is discovering something new. Call to mind the joy with which you got up on Sunday morning to go to the Liturgy; how eagerly you read the Holy Fathers, constantly discovering something new. If the Gospel does not open anything up to us, then that only means that we have shut ourselves off from having anything new opened to us. Call to mind the words of Christ to the Church in Ephesus: “Remember thy first love” [cf. Revelation 2:4]. 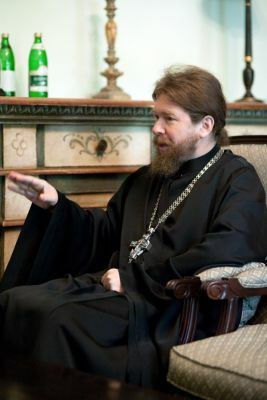 Archimandrite Tikhon (Shevkunov) is Deputy Abbot (namestnik) of the Sretensky Stavropeghial Monastery and Rector of the Sretensky Theological Seminary, both in central Moscow. Interview conducted by Anna Danilova, editor-in-chief of Pravmir.ru. Photographs by Anatoly Danilov. Russian text prepared by A. Danilov and O. Utkhin. This translation authorized by the author. Deputy abbot here translates namestnik. Since Sretensky Monastery is Stavropeghial (i.e., under the direct jurisdiction of the Primate), the reigning Patriarch of Moscow is always the titular Archimandrite of the monastery. Archimandrite Seraphim (Rosenberg) was born in 1909 and entered the Pskov-Caves Monastery in 1932, where he reposed in 1994. An allusion to the poem “To the Young Poet” (1896) by Valery Yakovlevich Bryusov (1873-1924), an influential member of the Symbolist movement. To “go Kronstadt” here translates the verb zakronshtadtit; it is a reference to St. John of Kronstadt (1829-1908), whose heroic and extraordinary deeds are sometimes naively imitated by the overzealous. “Ortho-nuts” is a translation of pravoslavnutyi, formed from pravoslav (Orthodox) and tronutyi (“touched”). “Orthodox brain disease” translates pravoslavie golovnogo mozga (literally, Orthodoxy of the brain). Both are crude but widespread memes. French adjective, meaning: conventional, accepted, proper; it has entered Russian as a single word: komil’fo. Yemelyan Mikhailovich Yaroslavsky (1878-1943) was a Communist party official, militant atheist, and leading anti-religious propagandist. Archpriest Nicholas Gurianov (1909-2002) was an outstanding spiritual father who spent most of his ministry serving as a simple parish priest at the Church of St. Nicholas on Zalit Island on Lake Chudo (Pskov Diocese, in the Republic of Karelia, a federal subject of Russia). “Forbidden Art – 2006” was a highly controversial art exhibition at the Andrei Sakharov Museum in Moscow that ran between March 7 and 31, 2007. It included pornographic works mocking the Russian Orthodox Church. Following a two-year trial, in 2010 the two organizers of the exhibit were convicted of inciting religious hatred and fined. 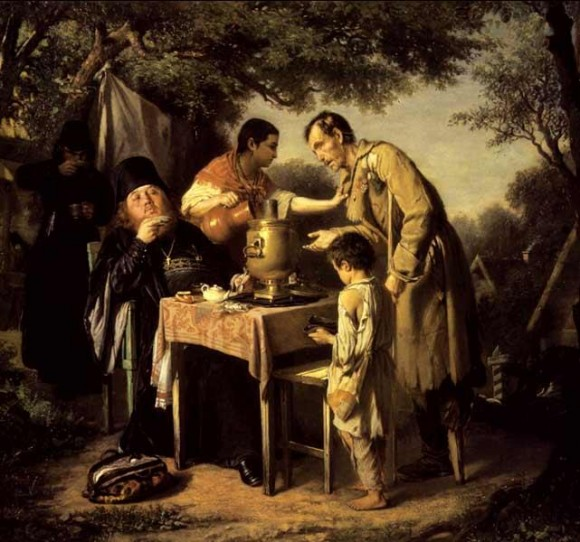 “Tea Party at Mytishchi near Moscow” is an oil painting on canvas by the realist Vasily Grigorevich Perov (1834-1882), completed in 1862. It is in the collection of The State Tretyakov Gallery in Moscow. Mikhail Vasilyevich Nestorov (1862-1942) was a Symbolist known for his portraits and religiously inspired paintings; he frescoed several churches in Kiev, St. Petersburg, and Moscow. His memoirs were published (in Russian) in two volumes in 1959.